Join us on Sunday, January 8 for our first Embroidery Make & Take of the year. 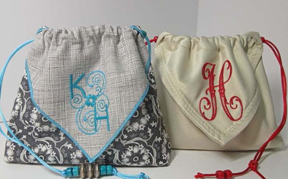 You’ll embroider on either a cloth napkin or fabric and then make this cute origami drawstring bag. Bring your machine and embroidery unit. Cindy and Ann will be your guides. Call 970-565-7541 to sign up.